Hard Copy Books & Reports Available – Request or Download Now! You’re making important decisions, and it’s important that you have access to as much information as possible so that you’re able to make the best decisions for you and your family. We have a number of free books and reports available to you, so that you can begin the information-gathering phase as early as possible. Whether you’re ready to hire an attorney now, you’ve already hired, or you haven’t yet wrapped your mind around the divorce or custody case you may be facing, requesting a copy of one of our free books or reports is a great place to start. You’ll get fast, free information about divorce and custody cases in Virginia, so that you’re ready to take the next step–whatever that may be. Here, you’ll find the complete inventory of the information we have gathered for you as you begin to consider the choices available to you. Have multiple issues keeping you lying awake at night? Request as many as you need; we’re here for you! Click on any of the books or reports below to request yours. Request Your Free Divorce Book Now! In our most popular publication to date, Charlie and Kristen Hofheimer, the father/daughter team discuss the most important facts that every woman facing a Virginia divorce needs to know. The different types of divorce. It’s free, so why not? It’ll help you begin to plan your first steps, too, so you’ll know whether you should call a lawyer, or whether you might prefer to handle it yourself. You’re definitely going to want to get your free copy first, before you call an attorney, sign an agreement, or make any plans. It’s a daunting prospect, and there’s a lot at stake, whether you’re facing a divorce, custody, or support case. You want to make sure you’re making the best decisions for you and your family, and you know that a lot of that has to do with the decisions you make at the beginning of the process. It’s not our goal to steer you in any particular direction; we just want to make sure that you have the best information possible to make a solid, informed decision. Whether you hire an attorney or not, you need to feel that your best interests are being protected. The questions you should be asking an attorney in an initial interview. How attorneys are ranked (so you can tell the good from the bad). 6 easy ways to save money on your attorney’s fees. What your first steps should be! Request Your Free Military Divorce Book Now! Request Your Free Custody Book Now! Custody cases are complicated, and full of unique issues. In fact, no two custody cases are exactly the same—which can make preparing for one difficult and intimidating. That’s why Kristen Hofheimer wrote “The Woman’s Custody Survival Guide” to help Virginia moms prepare for a custody case. Don’t shoot from the hip and have an emotional reaction; take your time to prepare for your custody case, so you can walk confidently into the courtroom, knowing that you made the best decisions possible throughout your case. Protecting your children is your number one priority, and reading this book will help ensure that you’re in the best position possible to do just that. It’s every mom’s worst fear, and the reason that all moms dread custody cases so much. What if the worst possible thing in the world happens? What if you don’t have the opportunity to spend every Christmas morning with your children? What happens if the court tells you that you can’t be the kind of mother that you want to be? What happens if they’re taken away from you, kicking and screaming? It’s a terrifying thought. The good news is that this is pretty rare, and that there are things you can do to put yourself in the best possible position before your case even begins. No matter what, you should be thinking now about the actions you should be taking to make your case as strong as possible. If you’re worried about losing custody, this report is for you! It’ll help teach you about the most common mistakes Virginia moms make, and how to avoid making them yourself. Find out here about the best interests of the child factors, the mom’s downfall, what happens when your child’s father alleges that you are making disparaging comments against him, and what to do if he’s making disparaging comments about you. It’s a can’t-miss report for any Virginia mom facing a custody case. When it’s a he said/she said, knock down, drag out custody case, how do the courts know who to believe? It’s a question we get all the time, and it’s a good one! After all, so much of the custody stuff is hard to prove with specific, concrete evidence, and we almost always end up with competing statements from both sides. It’s incredibly frustrating, and it’s often hard for the judge to tell who the better parent is. So, who wins? Is there a chance that you’ll totally lose custody? What can you do to prevent the worst case scenario from happening? You’ll need to find out what courts look at when they’re making decisions regarding custody in contested cases, and this report has all that information for you in one convenient place. Request your free copy today! Being stuck living somewhere you don’t want to be isn’t a position any mom wants to find herself in. After all, where you live, especially once you have kids, has a lot to do with the kind of lifestyle you enjoy. Whether you’re able to leave the children in the care of a trusted family member, or whether you feel that you’re almost completely without support—it makes a huge difference in your happiness and your physical and emotional well being (not to mention the well being of your children). When you move somewhere because of your relationship, you make sacrifices. Maybe you even gave up on a job. At the time, you may have thought they were sacrifices well worth making, but, in retrospect, once things didn’t work out, you might find yourself feeling differently. Can you move? And, if you move, can you take the children with you? What happens when you become disenchanted with the life you’re currently living, and want to re-make it somewhere else? How do the courts feel? In this e-report, we provide insight into how Virginia courts deal with relocation cases. Whether you’re moving thirty minutes away, or whether you’re hoping to move across country, you may run into some bumps down the road if your case ends up in the courts. You’ll want to request your free copy of our relocation report now, to make sure you aren’t surprised later on. Request your free copy today! Cases where we know or suspect that children have been physically or sexually abused are the worst. They’re made even more difficult by the fact that the cases themselves are pretty difficult to win. You’d think it’d be easy, wouldn’t you? But, in almost every case, the cases are minefields, filled with a million different ways that concerned moms can lose (yes, lose!) custody of their children. If you know or suspect that your children have been physically or sexually abused, by their father or anyone else, you need to tread carefully. You need to plan every single step you might be forced to take over the coming days, weeks, and months—it’s that important! A good way to start is to request a free copy of our report by clicking here. It at least begins to help provide you with the information you’ll need to protect your children. You can never start too early, read too much, or be too careful. These cases are difficult, even if you have years of family law experience, so you’ll want to start preparing now. To get your free copy, click here now! When your child’s father hasn’t always been in the picture, custody is a little bit more complicated. Don’t make the mistake of thinking that just because he hasn’t been involved doesn’t mean that he won’t be able to be involved later—chances are pretty good that he will. Where your children are concerned, though, you can’t be too careful, and you’ll want to make sure that, if he’s going to be involved, he does so in a way that protects their best interests. It’s hard to suddenly involve a dad who hasn’t been an awesome father all along; in many cases, experts (like therapists) work with attorneys and guardians ad litem to help make sure that dad is reintegrated into the family in a healthy way. You’ll definitely want to read up on reunification cases if you’re facing one. A good place to start is our reunification free report, which you can request by clicking here! Custody cases are difficult, but when your child is breastfeeding, it’s even trickier! Moms can choose to breastfeed their babies for years, and, for many moms, breastfeeding is pretty central to the kind of mom they want to be. It’s an emotional decision, as well as a practical one, and the idea that a possible custodial arrangement could exist that would not respect the importance of the breastfeeding relationship is appalling to many moms. But how do Virginia courts handle custody when the child in question is breastfeeding? It’s probably the first decision you really get to make for your child regarding how you plan to raise him or her, and the benefits to both mom and baby are well documented. In fact, you’d be hard pressed to have a baby and not encounter about a million different places that extoll the values of breastfeeding, and the importance of the breastfeeding relationship. How is breastfeeding handled in custody? Find out in this free report, written by former Hofheimer Family Law managing partner, Kristen Hofheimer, for the UVA Law School Law Review. Facing a divorce? Not sure what to do? You’re in the right place! Request a free copy of our report “20 Immediate Actions” to find out what steps you can take right this very minute to protect yourself in your up and coming divorce case. Divorce is a big deal, and you should take it seriously. You should be thinking strategically now, so that all the choices you make are ones that are specifically calculated to help protect you as your case moves forward. Now is the time to start asking questions, getting answers, and making plans. “20 Immediate Actions” will help you figure out what to do right now (not next week, next month, or next year) to protect yourself in your upcoming divorce case. Request your free copy now. You’re on Facebook. He’s on Facebook. We’re all on Facebook. But if you’re facing a divorce or custody case, you’re going to want to be careful. What you post on social media sites can come back and haunt you in a big way when you’re facing litigation, and most attorneys these days are looking for the dirt they can dig up on you on Facebook, Instagram, Twitter, and more. Think you’ll just delete your account? Don’t! You could be in trouble with the court for getting rid of evidence (and, since nothing on social media ever goes away anyway, they’ll probably still be able to find it). Want to protect yourself (and your case)? Read our free report, “5 Ways that Social Media Will Get You in Trouble in Divorce and Custody Cases” NOW, before it’s too late! Divorce is complicated. And, if you’ve never been through it before (and even if you have), it’s hard to know what’ll come up. What decisions you’ll have to make. How you can strategize to protect yourself (and your family’s) best interests. If you’re wondering what steps you should be taking now, request a copy of our free report on the 12 mistakes we commonly see women making in divorce cases! By knowing where other women have tripped up, you can make sure that your interests are protected, and that your divorce will go off without a hitch. It’s too important not to make sure you have all the information you need to make the best choices possible. Request your copy now. If you’ve just started thinking about divorce, it’s smart to start planning! Divorce is the single biggest financial transaction in most adult’s lives, and it’s doubly important if custody and visitation is involved as well—so any time you spend preparing can pay you back in spades when the rubber hits the road. You want as much information as possible so that you can begin planning your beginning steps as carefully and as reasonably as possible. The more you know, the better! A great way to begin learning about the divorce process in Virginia is by attending our monthly divorce seminar. For more information about the seminar, click here and you’ll receive a free copy of our divorce seminar options white paper! 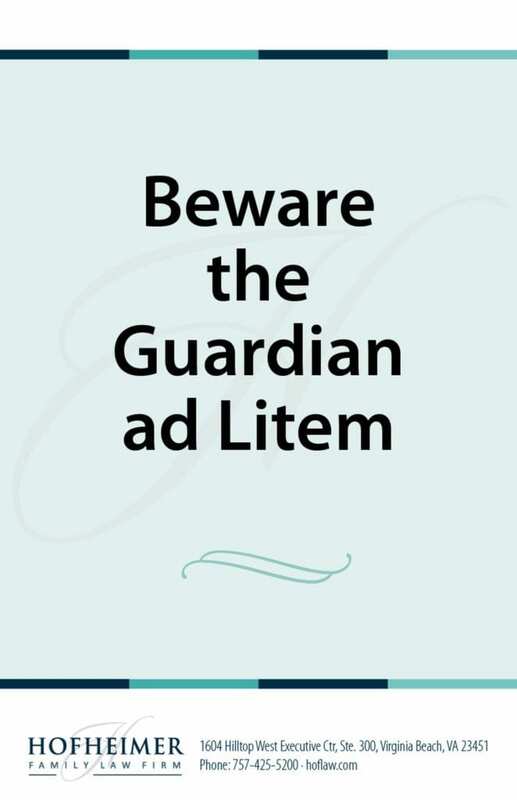 Request your free copy of our report, “Beware the GAL” now. So, what happens when I request a book or free report? You just fill in some easy information–first name, last name, zip code, and email address. Immediately after you click “submit,” you’ll get an email with an electronic copy of the book or report–so no time is wasted. You can begin reading right on your computer, or print it up and begin writing and highlighting in the margins. What happens if I want a hard copy of the book and not just an ebook? Absolutely! Most of the women we work with don’t want their husbands to know that they’ve requested any of this information. The contact information you provide to us is completely secure. We won’t call, email, or mail anything to you unless you’ve indicated that it’s a spouse-safe way to contact you. Will your book help me figure out what to do? Yes! Each book was written by one of our experienced divorce and custody attorneys, and answers some of the most common questions we see. We’ve done a lot of work to make sure these pieces provide you with detailed, up-to-date, Virginia-specific information designed to help women facing divorce or custody cases. Not only that, but when you request a copy of one of our books, you’ll have the opportunity to opt in to one of our divorce, military divorce or custody e-courses. Each e-course was written by one of our attorneys, too, and provides you with even more information, beyond what we provide in the books. After you request a copy of one our books and complete an e-course, you’ll know more about divorce, military divorce, and custody cases than 99% of Virginians–and certainly more than your husband!